The Broadbill is a name which was appropriately (as can be seen by the diagrams) given by Swainson in 1837 (Classification of Birds ii. 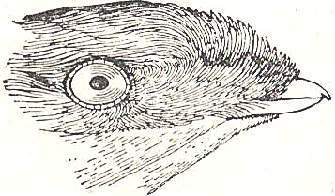 p. 80), for a remarkable group of birds comprising what was then the genus Eurylaemus of Horsfield (Trans. Linn. Soc. xiii. p. 170) and some allied forms. 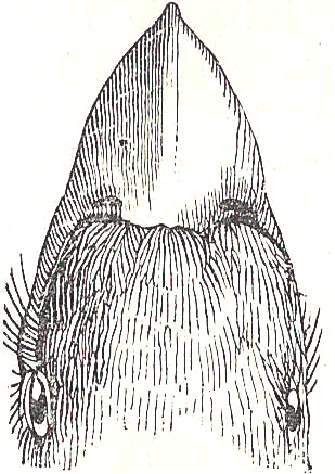 The position of this group, which was in 1842 recognized by Baron de Selys-Longchamps as forming a good Family of its own, Eurylaemidae (now generally spelled Eurylaimidae), had long been doubtful, some authors regarding it as allied to the Muscicapidae (FLY-CATCHER), others to the Coraciidae (ROLLER), and so forth. However, the Eurylaimidae, differed, from all other PASSERES (so far as they had been examined at the time), in "their retention of a plantar vinculum," as first noticed by Garrod (Proc. Zool. Soc. 1877, p. 449), which fact led. W. A. Forbes to propose for them further separation as Desmodactyli (op. cit. 1880, p. 390). But what seems to be a stronger reason for separating them is that, as Mr. Sclater had already shown (Ibis, 1872, p. 179), the manubrium, or anterior projection of the sternum, is not forked as in other PASSERES. In modern 21st Century times, the Broadbills or Eurylaimidae are established as a family of their own , and comprises 9 genera, within which around 14 different species of Broadbill exist. Two of these, the Long Tailed Broadbill (Psarisomus dalhousiae) and the Silver-Breasted Broadbill (Serilophus lunatus), are found in India. The style of plumage in the Silver-Breasted Broadbill recalls that of Ampelis (WAXWING), but no affinity thereto can be thought to exist. They are nearly all birds of great beauty, and the three species of Calyptomena, The Green Broadbill (Calyptomena viridis), Hose's Broadbill, (Calyptomena hosii) and Whitehead's Broadbill (Calyptomena whiteheadi) are remarkable for their rich green plumage, and the way in which the frontal feathers project upwards and forwards, so as almost to conceal the bill, and being adpressed form a disk-like prominence. Broadbills are frugivorous, but members of the genus Eurylaimus seem to be insectivorous. They are said to be relatively unintelligent birds, and usually keep in small flocks. As well as being found in the elevated part of India and extending to the Philippines, a few species can also be seen in Africa. Examples of other broadbills occur in countries further to the east, and populations are especially developed in Malacca, Java, Sumatra, and Borneo.